Practice: Core focused flow building into standing postures, including Utitha Hatha Padagustasana. Inspiration: Yoga=to yolk, union with body, mind, spirit, God. Life lesson: I am not this body. This body does not define me. It’s a vessel. As much as I want to just totally let go of this body — to forget about it, I can’t. Because yoga won’t let me. It’s a union of body, mind and spirit. Yoga is a chance to connect with this body and what it’s capable of — to appreciate bones, joints, muscle. Strength. And brain and heart. Because without this incredibly flawed, diseased body, mind and spirit wouldn’t exist. Wouldn’t be living, experiencing or breathing. Wouldn’t have the opportunity to enjoy my husband, daughter, my life. I wore a very orange, very long, and full dress today. It yells, doesn’t whisper, summer and feminism. 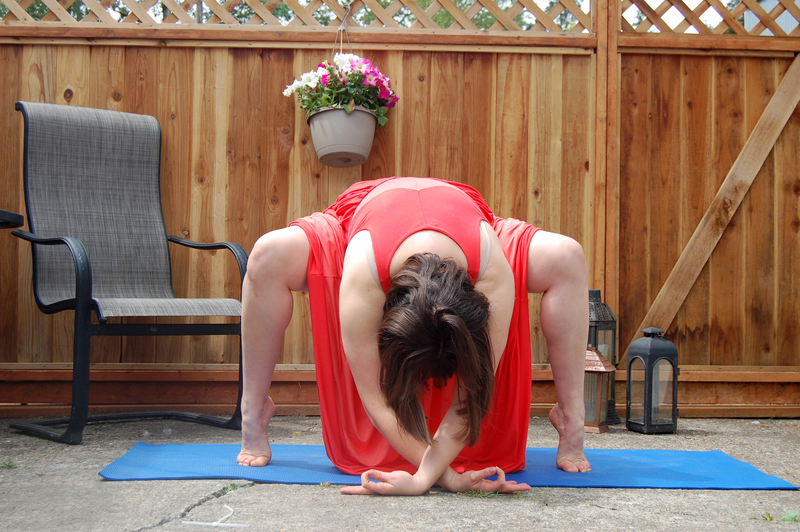 After church, after toddler was down for her nap, I went to my backyard sanctuary to play around with some yoga – in my big orange dress. I took my camera thinking maybe the dress would create an artful picture. Maybe I could blog about how beautiful and flowy it made me feel; an opportunity to spread some real yoga body-positivity. Timer set. Run to mat. Snap first picture. Several poses and deleted pictures later, and the only one I could even handle looking at was one that perfectly hid my adipose tissue (ehem, fat) and my God-given awkward face. I finally decided this was as good as it was going to get. It would never get any better. I felt defeated, no joy left to do yoga. I lamented in Child’s pose until my legs fell asleep, and then moved myself into a prone position until my arms tingled. Finally I moved to a chair and sat even longer. I sat in deep contemplation. My self-reflection had me wondering and playing out what ifs. What if I were to be totally mangled, (face and body)? Could find happiness despite my ugliness? This thought reminded me of that saying (or maybe it’s just a popular meme) that basically says I am not my body, my body is just a vessel. The person I am. The person I want to be. The person I hide. That’s who I am. Not this flesh, which by the way is incredibly strong thanks to yoga (I mean, check out the budding definition in my arms! Woohoo!). I am this geeky, overly emotional, awkward, wife/mom/daughter who likes pretty dresses and loves God, and loves teaching and doing yoga. My flesh doesn’t have anything to do with it. Really, my flesh is not just a vessel. It’s a barrier keeping me from fully expressing, experiencing and appreciating my individuality. I still don’t have the courage to share the pictures that show my tricep flab, or the ones with my pouty lip (which is almost Bubba-Gump pouty from a profile angle) and my 31-year-old turkey neck. But, the point is: Self-actualization. And body acceptance, of course. Contemplate. Meditate. Pray. Love. Yoga. 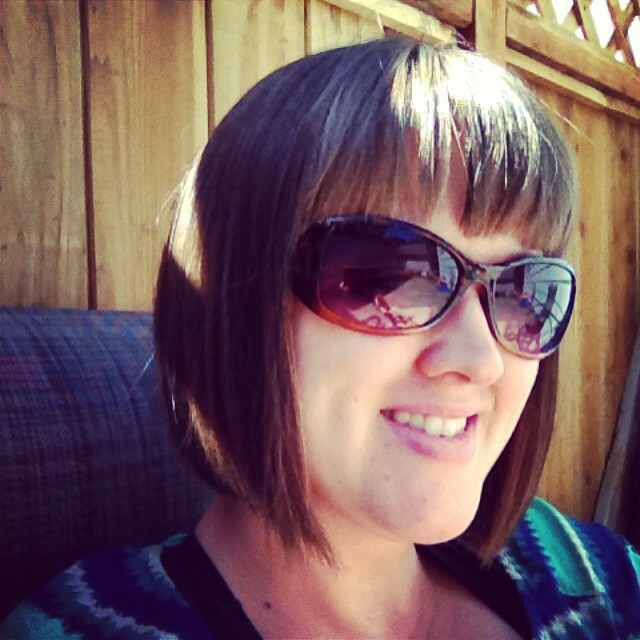 That’s how I’ve been shifting from self-loathing to self-loving. Why do we hate Tess Holliday? By now we’ve all seen her, Tess Holliday, the size 22 model. She’s beautiful, don’t you think? When I read the articles and saw the magazine covers I was marveled by her gorgeousness. But it was all spoiled by reading the comments. People literally hate her and what she supposedly stands for: an unhealthy lifestyle. Eat a salad; Go for a run, they said. Many commenters spouted nothing but negativity at this big beautiful woman. But why? What is it about her that makes us, as a society, want to hurt her with hateful words and bigotry? Loving our bodies as they are, as Tess Holliday loves her body, means we’ve giving up on ourselves. It means we’ve given up on our health, on how we look, on our futures, on our love life, ect. etc. etc. Or that’s what we think, and it’s scary. We (the collective we) hate Tess Holliday because we fear Tess Holliday. Society tells us how we should look, how we should dress, and how we should live. If we follow these examples set by multibillion dollar corporations, then we will surely find happiness in this lifetime. But, if we embrace and celebrate our individuality, we’re doomed to live a life of ugliness and depression. As all my years of yo-yo dieting were coming to a peak, I struggled with the idea of being healthy for health’s sake and not for the sake of losing weight. I thought if I started being kind to myself and letting myself experience grace, I would NEVER lose weight and it scared the Hell out of me. Why? Because skinny = happy. If I could just lose weight, I wouldn’t struggle with depression or confidence issues, I’d earn more money (because thin yoga teachers do), and I’d have more friends (because thin-happy people are more fun to hang out with). Here’s the yogic truth in all of this: It’s a bunch of bull. If I embrace my size 12, like Tess Holliday has embraced her size 22, and allow myself to be and feel beautiful what would happen? I’d obviously be eating cheese burgers and whole bags of chips at every meal. I’d never exercise and I’d generally stop caring about life all together. No. Again, bull. You CAN embrace yourself no matter what size, or height, or awkward physical feature and STILL maintain a healthy lifestyle. In fact, if the goal is to really love yourself, you’d likely take better care of your body. The hard part comes in embracing yourself in this current moment and being kind to yourself through the whole process. The real yogic truth comes in being in the NOW — living in the present moment. At this current moment, there is nothing I can do about being a little soft around the midsection. But I can love myself. I can love myself like Tess Holliday loves herself. In my mind she’s not promoting an unhealthy lifestyle. To me she is clearly promoting being beautiful in this moment, despite health and wellness goals. Just like loving a significant other, learning to love yourself in order to eradicate a negative body image takes time, work, effort, respect, and constant reminders. If you’ve battled your body your whole life, as I have, you are not going to, realistically, wake up one morning and just decide that you love everything about yourself. You’re still going to have insecurities, fears, moments of sadness, and icky envy… <–Gosh, doesn’t sound very promising, eh? But wait a minute! There is still hope. I can’t guarantee this is how it will be for you, but when I decided to stop dieting and focus on intuitive eating, and then a couple years later decided to lose hate instead of weight, I felt lighter. I think it was years of guilt I felt float off my shoulders – a lifetime of being told by peers and media that, because I had fat, I wasn’t a significant human being—woman. And I still struggle with loving myself at all times. Heck, my biggest trigger is seeing myself in candid photos. Eeek! While I didn’t cry this time, I sure felt all those nasty little emotions popping up as I looked through vacation pictures. Here is the amazing thing, though. I didn’t cry. I looked at some of those pictures for a while. I sat with them until it didn’t hurt so much anymore. Then I made myself say something nice about the picture. Even something simple like, my hair looks shiny, or my legs are almost tan! Then, in those moments of “feeling fat,” I start down the path of “I need to lose weight” really quickly. But not long after follows some internal dialogue about needing to stop that; if you exercise you do it out of love; if you eat, you eat for health; etc. It’s a process. It’s a journey. Hang in there. You can get through each and every icky moment! 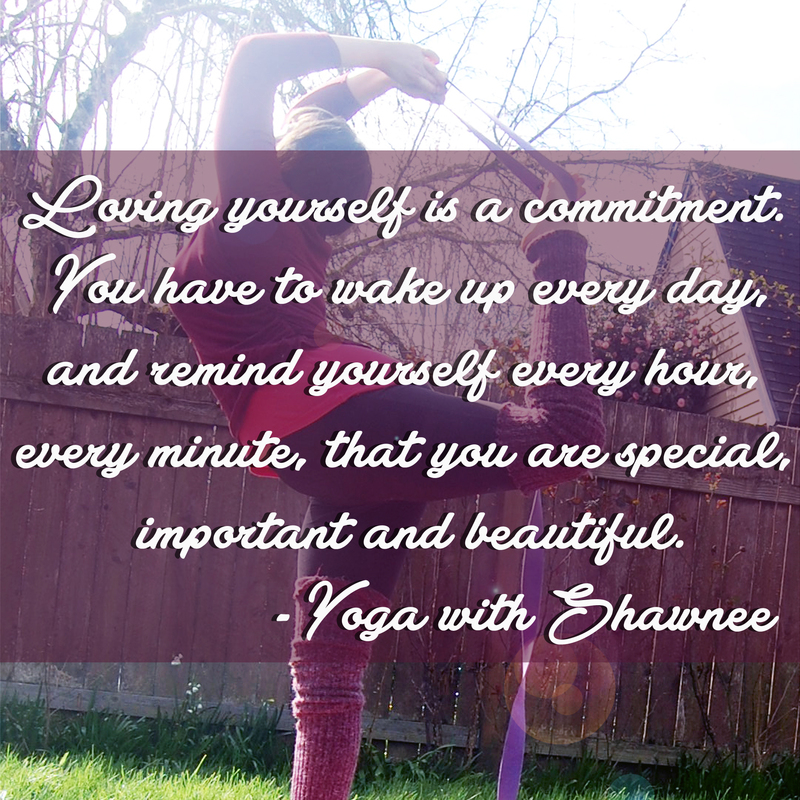 Loving yourself is a commitment. You have to wake up every day, reminding yourself every hour, every minute, that you are special, important and beautiful. New blog post! This past week I had the opportunity to listen in on a tele-summit regarding yoga and osteoporosis. The information I gathered was very helpful and so beautifully fit into the “body love” and “yoga for all” direction I’m taking my teaching. Loving your body at any age is equally as important as loving your body at any size, etc. 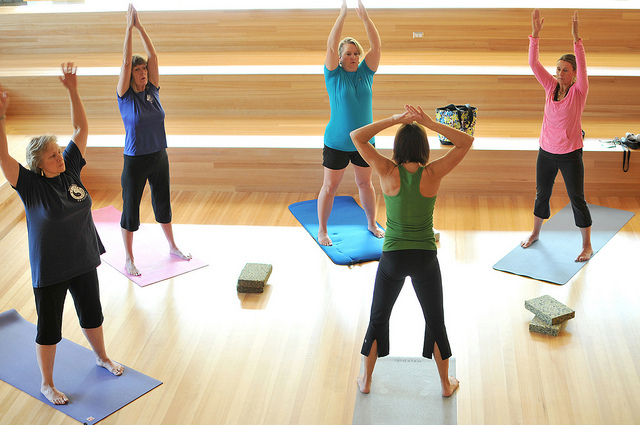 In short: yoga can both prevent and reverse osteoporosis. <-What a better way to love your body than with prevention! 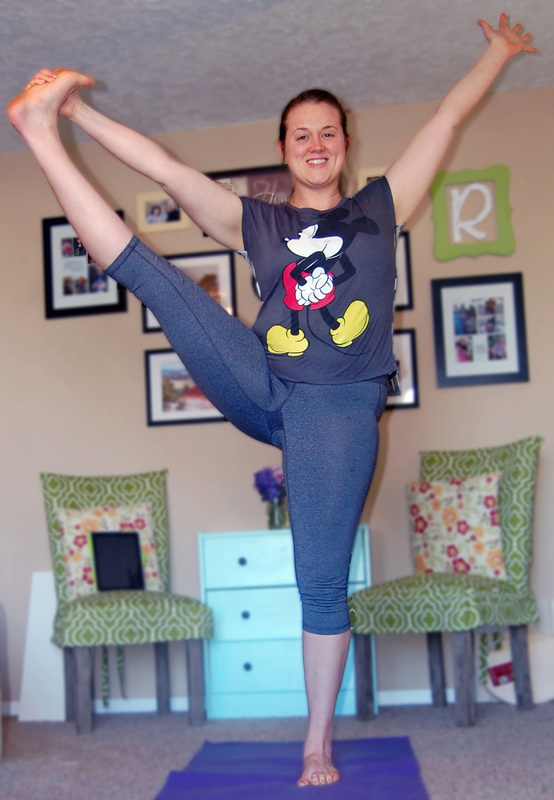 Read my notes to for the DOs and DON’Ts of Yoga for Osteoporosis. Photo credit: According to Bing this image is free to share and use. ***The information presented in this article are my notes on the free YogaU.com tele-summit , “Yoga for Osteoporosis: Prevention and Practice,” as presented by Dr. Loren Fishman and Ellen Saltonstall. For eight years Dr. Fishman, who is also a well-known yoga teacher, has been studying effects of yoga and building bones. Throughout this eight year span, Fishman collected data on 900 participants and found the average participant, who was in the Osteoporosis range before starting yoga, had re-grown bone mass and came out of the Osteoporosis range. In other words, bone can re-build mass and adapt if appropriate, healthy pressure is applied. 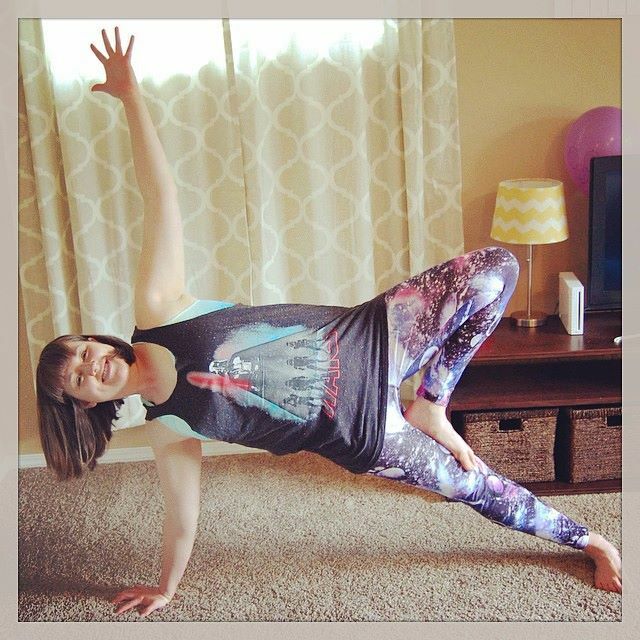 Gentle, strength-building forms of yoga provide a compressive force that stimulates the bone. As muscles are worked, the muscles pull on joints and bones to stimulate growth. Dr. Fishman also found that yoga works just as well (if not better) to reverse Osteoporosis as pharmaceuticals such as Boniva. Fishman states that Boniva does work, but has its problems and one thousand and one side effects. Yoga on the other hand, has no negative side effects (if practiced safely) and can improve posture, balance, coordination, range of motion, strength and anxiety, all of which are important to aging bodies. Osteoporosis is not just a concern for those who are older. Prevention should be a concern to those of any age. Dr. Fishman states the earlier in life you start your yoga practice, the better, as a yoga practice can help prevent osteoporosis. Ellen Saltonstall, a well-known yoga teacher and assistant in this yoga study, gives some advice for those who have Osteoporosis, or may be at risk to Osteoporosis, and would like to begin a yoga practice. -Check with a physician. Get a DEXA scan. Check for other medical problems. -Find a qualified yoga teacher. Yoga Alliance registered is important, but experience and background are also things to consider. -Use care and intelligence. Start slowly & gradually. -Practice regularly. Ideally 30 minutes five to seven days a week. Slowly build up amount and frequency. -Focus on strength and balance rather than stretching or relaxing. -Prioritize poses that extend the spine: back-bending, which build strength and counteract kyphosis. – Avoid flexing (bending forward) the spine with speed and force. -When practicing balancing poses use props, wall, chair. -When twisting, avoid curving the spine. Don’t force with leverage. Focus on lift of the spine and raise the hips with a blanket, block or towel. -Avoid inversions until proper guidance and enough strength in the arms and shoulders. -Avoid excessive weight bearing on the hands and wrists before you’re ready. Build up strength slowly.